One of gaming's most iconic franchises hits its 3rd decade, and the orchestra dedicated to performing its diverse music hits the road once more to celebrate it. If there was one video game series that defined a large part of my adolescence, it was Final Fantasy. I read about the 1st game in an issue of Nintendo Power, and later saw a junior high classmate play Final Fantasy IV on the SNES. I saw how Final Fantasy VI got a good following during its initial release in 1994, and I finally jumped onto the RPG bandwagon (like many other fans) with Final Fantasy VII. While the gameplay and stories were fun, it was actually the music from the games that made me remember how the stories went. Every game in the Final Fantasy series has some amazing pieces that rival today’s contemporary music. Last December marked the 30th anniversary of Final Fantasy, and what better way to celebrate it than with a symphony concert tour commemorating its 10th year of treating the series’ music with honor and respect. 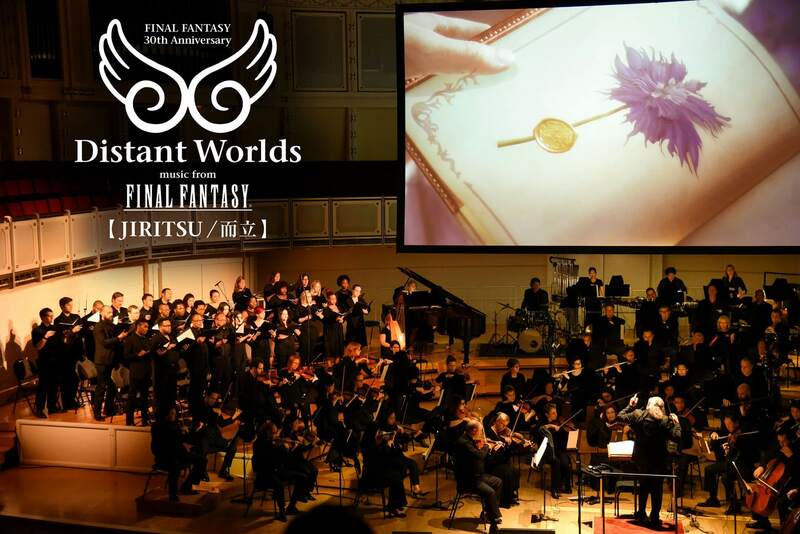 Final Fantasy Distant Worlds once again took fans, young and old, on a musical journey with songs from a series that has generated all kinds of emotions throughout the years. I decided to go along (for the first time ever), and it was a glory to hear music from the games become classical works of art. 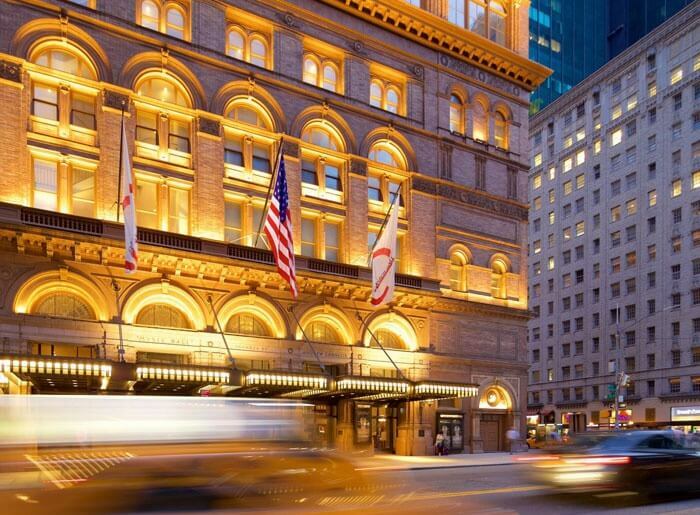 I attended the concert at New York’s prestigious Carnegie Hall, and as I arrived, the entrance was already packed with Final Fantasy fans waiting to get in. Once everyone was seated, conductor (and co-founder of Distant Worlds) Arnie Roth started the show, with Final Fantasy original composer Nobuo Uematsu in attendance. What was a surprise to me and other fans was that Yoko Shimomura, composer of Final Fantasy XV and a whole slew of other games, was in attendance as well. 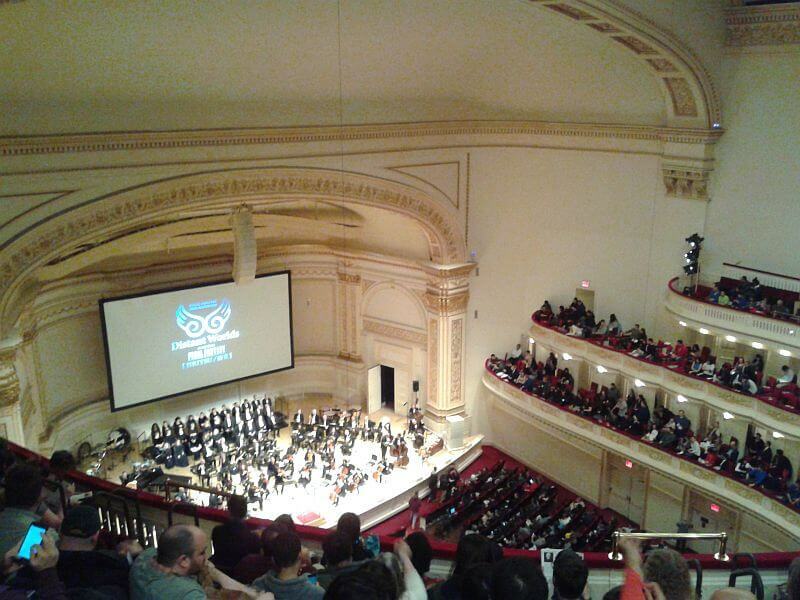 The orchestra played 22 songs from all the various games, with video presentations accompanying the music. Below are the setlist and some thoughts about each of the pieces. The Prelude (Final Fantasy Series) – The original piece that started it all. This is the classic “Start screen” theme when you began the games. What was nice about the presentation was that it showed CG scenes of all the main characters from Final Fantasy I through Final Fantasy XV. Also, the choir was fantastic with their vocals during the song. A very nice and soothing start for what’s to come. Clash on the Big Bridge (Final Fantasy V) – The Gilgamesh song. This is first played during a major scene where the heroes are fighting monsters on a long bridge back to safety, where they encounter one of the series’ mainstay villains/anti-heroes, Gilgamesh. The concert’s version of the piece was as epic as it sounds. I loved the presentation showing the Gilgamesh battles from FFV in all of its 16-bit glory. Victory Fanfare (Final Fantasy Series) – The memorable victory song heard after every battle. Short and sweet. It was unfortunate that they didn’t go longer than the initial 3 seconds because there’s some good music afterward. Cosmo Canyon (Final Fantasy VII) – One of the more underrated tracks in FFVII. Hearing it again was beautiful, as the presentation showed Red XIII’s journey back to his hometown of Cosmo Canyon, and his discovery about the heroic past of his deceased father. There was even gameplay footage of it all. According to Roth, this was a new track into the concert program, and it’s a well-deserved one. Not Alone (Final Fantasy IX) – One of my favorite tracks from my personal favorite Final Fantasy. This is the song that played when the main character Zidane Tribal goes through a major depressive episode, tries to ignore all his friends (who all come to his aid) while fighting through monsters, and ends up seeing that he has real friends in the end. While the orchestra did a good job, I just didn’t feel the same amount of emotion as when I hear it in the game, since the presentation showed all the FMV cutscenes from FFIX. The timing felt off to me, and I felt that it would have been better if they showed Zidane’s entire ordeal with the music instead. Flash of Steel (Final Fantasy XII) – Coming off the release of The Zodiac Age HD remastered game, this was the type of track that got me pumping. The piece is played as one of the many boss battle themes in the game. It totally synced with the FMVs of FFXII shown on stage. You really wanted to fight an empire after hearing this. This is a good introduction to the work of Hitoshi Sakimoto for fans who missed out on FFXII. The Oath (Final Fantasy VIII) – A stand-out song from one of arguably the top 3 Final Fantasy soundtracks. This is played during key speeches/conversations in the game. The concert version was played alongside FMV footage of Squall and Rinoa to signify their growth due to their love for each other. Searching for Friends (Final Fantasy VI) – The concert version of this song was amazing. This is the world map song played during the 2nd half of the game after you get an airship. The piece was loud to show how important it was to find all the party members in the game to save the world. The presentation footage was incredible, as it portrayed all the key reunion scenes from the Super Nintendo version of the game. This was so beautiful to hear. Fang’s Theme (Final Fantasy XIII) – I never played FFXIII, so I didn’t know what to expect. The song was uplifting and portrayed an air of confidence. I have little to say about it. Theme of Love (Final Fantasy IV) – A touching ode to the Final Fantasy game that arguably started the cinematic direction the series would embrace in future games. This is the theme song of FFIV’s heroine, Rosa. I loved how the presentation used CG cutscenes from the Sony PSP version and gameplay footage from the Nintendo DS version to show off the characters that made FFIV memorable. Apocalypsis Noctis (Final Fantasy XV) – It wouldn’t be a Final Fantasy concert if there wasn’t music from the latest installment. This is the track that plays when main character Noctis has to fight one of the Titans in order to gain their power. Along with footage of Noctis in action, this was solid to hear live. Liberi Fatali (Final Fantasy VIII) – The song first heard in FFVIII’s 3-minute FMV intro. As soon as the choir recited “Fithos Lusec Wecos Vinosec,” the crowd reacted with joy. This was the final song played before the 15-minute intermission period and it was the perfect song to end a stellar 1st half. Opening – Bombing Mission (Final Fantasy VII) – A classical update on a song that introduced a large number of late-’90s RPG fans all over the world to Final Fantasy. This version was used for the 1st trailer to the upcoming Final Fantasy VII remake. Of course, the presentation showed footage from that very trailer. Roth made a comment telling Square Enix to hurry up and release the game, much to the delight of fans in the audience. Somnus (Final Fantasy XV) – The main theme of the game. Roth played a violin for the song, which was a nice touch to it. If you’ve played the game, it’s sad to hear because the footage showed the moments where the heroes go through tough times along their journey. Heavensward (Final Fantasy XIV) – This was the main theme played in the trailer for the Heavensward expansion scenario. Hearing it and seeing the trailer footage made me want to play FFXIV, since it has developed a major following after having a rough start during its release. Cinco de Chocobo (Final Fantasy VII) – This piece was hilarious to hear because the presentation showed footage of Cloud hunting for the famous Chocobo birds on the world map. The crowd ate it up. What made the song good was the footage of EVERYTHING Chocobo-related in FFVII. Choco-Mog, Fat Chocobo, the Chocobo Sage, Chocobo breeding, Chocobo Racing. You name it, it was there. Zanarkand (Final Fantasy X) – While I did say the Prelude was played at the start of Final Fantasy games, FFX was a big exception. What you got was a somber piece reflecting a journey to a place that had consequences for the game’s heroes, and the concert made fans remember that feeling. Roth told fans before the song played that he considers the piece to be Distant Worlds’ mainstay track. I believe him because if you played FFX, “Zanarkand” is literally a trip to a place that’s distant, but somehow touches your heart in the end. Opera “Maria and Draco” (Final Fantasy VI) – The famous opera sequence in FFVI and one that was such a revolution at a time when voice-acting in video games was rare. Three opera singers were there to do all of the opera’s speaking scenes, along with a narrator to tell the opera’s story. Everything about this performance was well-done. There was even footage of the game sequence where the villain Ultros plots to drop a weight onto the character Celes during the opera and the party has to stop him within 5 minutes. The whole opera scene was something to behold. I felt this was the best track played at Distant Worlds. Main Theme (Final Fantasy Series) – Hearing this made me smile. This is played in the ending of most of the Final Fantasy games. The presentation showed credits thanking the fans for their support. This rendition sounded like the Final Fantasy VIII version, which Uematsu once said was the ideal version of the theme in his mind. But oh wait, we haven’t heard what fans really wanted to hear. Two encore songs were played, and one of them was bound to be played sooner or later. Encore 1 – Aerith’s Theme (Final Fantasy VII) – The feelings when hearing this song get me tearful. It didn’t help that this rendition was played alongside Aerith’s first meeting with Cloud at the church. The piece really highlighted how heartbreaking FFVII’s biggest moment was when it happened. Encore 2 – One-Winged Angel (Final Fantasy VII) – Arguably Final Fantasy’s most iconic song that defined one of gaming’s most memorable villains. Roth got Uematsu to be part of the choir and wanted the audience to chant “SEPHIROTH” during the chorus. The song was played alongside footage of the Final Fantasy VII: Advent Children movie. I don’t think this song will ever get old because the pacing is perfect. 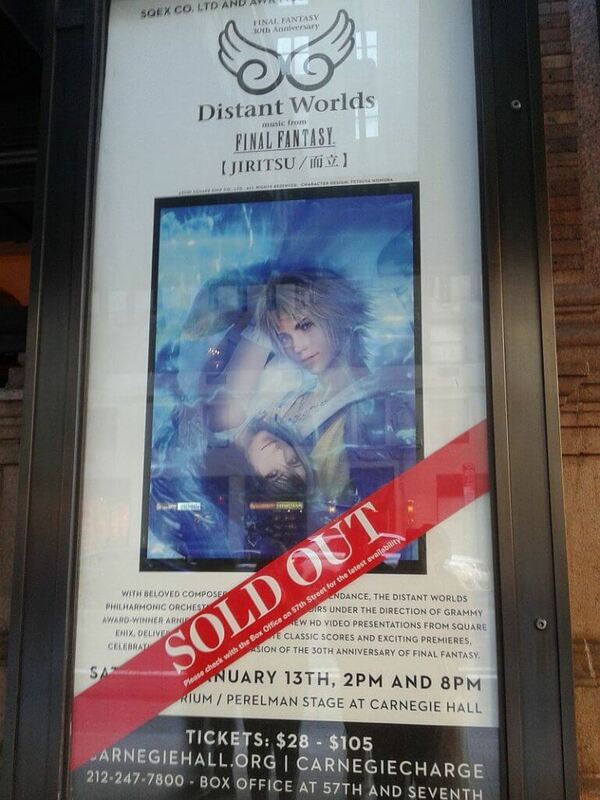 Now that I went to Distant Worlds and saw for myself what the hype was all about, I want to go to another show in NY in the future. I went through a Final Fantasy nostalgia trip in the past couple of years due to Final Fantasy speedrunning. Listening to the various music from the games during this time made me remember why I was fond of Japanese RPGs in the first place. Although I haven’t been a huge fan of Final Fantasy for a few years, I still hold the series deep in my heart. Seeing many fans, some of whom traveled from out-of-state, come to the concert made me appreciate how much Final Fantasy was an important part of their lives. If you love the series and especially the soundtracks, I highly recommend attending a Distant Worlds concert if it plays in your area. Hearing your favorite game music live alongside other fans in a symphony hall is an experience that will touch you. I can’t wait for another adventure to a beautiful crystal world full of sounds guaranteed to stir up my heart. You can visit the Distant Worlds website for more information about the tour and the music being featured at ffdistantworlds.com. We also have a Final Fantasy gift guide with links to purchasing the Distant Worlds albums!